Shop fitters are called shop fitters for a reason. The “fitter” part is actually pretty important. You know? So that everything fits in? I gather tape measures would feature strongly among their list of must-haves. I know that’s bleedingly obvious. For some reason it only came to me when I was reading through way-old posts from far-distant-time-vortices (correct me if I’ve got the plural of vortex wrong – I’m kind of winging it and would appreciate a yea or nay on that one). That one post about that one time when I was setting up a shop. A cooler, funkier, sweeter shop there never was, but I have to say, there were a few moments in the lead up to opening day when the medicinal wine bottle copped a flogging. I’m actually quite good at organising things. I’m a great list writer, I think outside the square, I work well under pressure, I’m into detail. Well, most details. I admit that occasionally the odd unimportant, barely noticeable, who’d-miss-it-if-they-didn’t-know kind of detail gets overlooked, but that’s okay in the scheme of things. Usually. If you’re planning to open a cake shop, you do need to be an excellent list maker. My suggestion would be to delegate as many items as possible on that list to other people, but since my budget was adequate rather than generous, that’s not what I did. No, I chose to do it all – source suppliers, source equipment, source building materials, source tradesmen, source quotes – no wonder I added hitting the sauce to that list! Sheesh! So, I am ordering stuff. Stuff on my list. Lots of stuff. Big stuff, little stuff, edible stuff, stuff to put other stuff on or in or under. I have a specific look in mind for the shop but of course my cupcake-budget doesn’t extend to the 5-tier- jewel-encrusted-sculpted-dream-cake cost of joinery and glass, so instead I rent a mobile cake display unit to sit in between some rustic sideboards I hope to steal from my home kitchen without anyone noticing. On a side note, I always thought husbands were never meant to notice things like new clothes, thrown out leftovers or pieces of furniture. “Where did the sideboard go?” or “Where’s that beef stir fry from last weekend? I hope you didn’t throw it out?” or worse, the casual “New top?” which is nearly always countered with “Oh, just a hand-me-down from my good friend Audrey” or “You’ve seen this old thing before!!”. I should be Catholic for the guilt I feel for minor shopping indiscretions. Back to the tape measure. The one in italics back at the beginning of this post. I’d been using hubby’s tape measure – one of the metal ones that tradesmen use, the sort that when you hit the button to reel it back in you run the risk of losing a finger as it shoots back into its case. I like it – it’s kind of fun putting the bend in it when you need to take a few more steps back and pull out a few more metres. If I hadn’t spent the last month renovating a shop, I’d have said playing tradie was fun. My shop was quite small. Patrons entered through a wide sliding glass door that had similarly sized glass panels on either side. They approached the rustic-style counter aka sideboard (provided my husband turned a blind eye to me sliding it out of the door at home) and a generous cake display cabinet with anticipation. This was the plan. The equipment-hire people emailed me with a delivery date for the cake display unit, which they fail to meet not once but twice, so I called them to let them know that I would be out of town for the next two days so can they please deliver it on the following Tuesday. The Tuesday after Easter weekend, actually. No problem, they say, all good, the driver will call you before he gets to town. Noting the new date down on my list,I head off for a buying trip to a major regional centre a couple of hours drive away. The day was sunny and clear, the shop attendants were friendly and helpful and all is good with the world. Happy with the day’s progress, I start the drive home. Fifteen minutes into the journey, my mobile rings. It’s my friend, the English Rose, who I worked for until the shop claimed me full-time. She had received a call from a courier driver (how on earth did he get HER number?) saying he had my cake display unit and had been waiting around for an hour for someone to unlock the shop and let him in. So English Rose and her hubby KB were hurtling into town from their country idyll to assist him. Could I arrange for a key? I called my father who had a spare set of keys and he popped down to let them in. Whew – I think – that was annoying but disaster averted. I continue the drive home. The mobile rings just minutes later. The cake display unit, securely wrapped to the inth degree and strapped to a pallet, won’t fit through the door of the shop. Any door. The driver is agitated because he is running late (not that he should even be there until the following week!) and so the capable and highly organised English Rose and KB have the pallet hoisted onto the back of their flatbed truck and take it home for the Easter weekend. As you do. They ring me to let me know – my should-have-been-Catholic guilt flares and I am desperately grateful for such good mates. Then my father rings me to let me know what has transpired and to ask incredulously so you didn’t measure the doorway before you ordered the unit? Well, maybe, I thought I did. In the picture, it looked about the right size. Which of course was not what I said. I’m not that silly. So, I’m driving home in the dark wondering what the heck I am going to do with a piece of furniture that (a) refuses to enter my shop and (b) that I am locked into renting for the forseeable future. By the time I arrive home, the good news has reached my husband who naturally must ask you didn’t measure the doorway before you ordered the unit? with a tone of disparaging disbelief, at least three times, with the emphasis on a different word each time. E.g. 1. 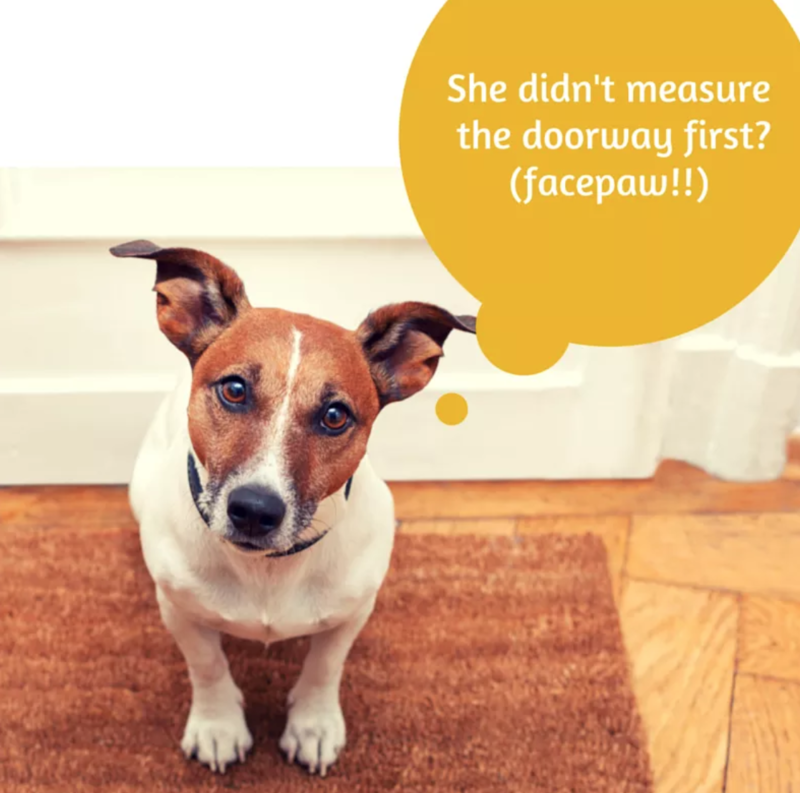 You didn’t measure the doorway before you ordered the unit? – delivered with a fairly even tone, simply a question. 2. You didn’t measure the doorway before you order the unit? – stress is on DIDN’T – as in – well it’s so bleeding obvious that you would! 3. You didn’t measure the doorway before your ordered the unit? – stress is on BEFORE – as in – well it’s so bleeding obvious that you should! 4. You didn’t …. NO I FLIPPING WELL DIDN’T! OKAY? STOP ASKING ME THE SAME QUESTION AND LET’S WORK OUT HOW TO GET IT IN! please…. It was fine in the end, of course. KB just had to remove a glass panel from the front of the shop to get it in and find a forklift to get it off his truck. Nothing major (eye roll). The true course of shop-keeping never runs smoothly, sigh. After the front of the shop had been replaced and the pallet removed and everyone else had left and it was just me and the cake display unit, I carefully removed the wrapping, the cardboard, the tape and the internal wadding and took a good look at my new piece of equipment. After a moment of silent, happy appraisal, a slight furrow appeared on my brow. I picked up the tape measure. I measured the width. I measured the depth. I measured the doorway. I leant back against the wall and shook my head. I may even have smiled, in a kind of oh-you-have-to-be-kidding-me-nose-snorting kind of way. And I think you know why….